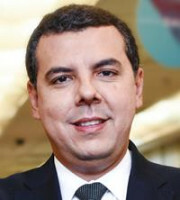 André Oliveira joined Daniel Law in 2011 as head of its legal department. With over 20 years of experience, Mr Oliveira’s practice specialises in IP litigation, trademark prosecution and privacy and data protection. Mr Oliveira also manages clients’ IP rights portfolios, with a focus on providing strategic counselling related to the launch, development and expansion of their businesses in Brazil. LLB degree from the Rio de Janeiro Federal University. Brazilian Bar Association, Rio de Janeiro section – IP and Anti-counterfeiting Committee.